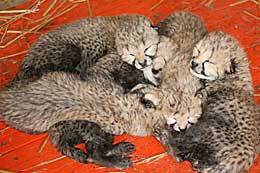 Watch Live inside our Cheetah Breeding Facility! On March 21,2016, Milani, a second time mom, gave birth to 3 cubs (2 males and 1 female), sired by Hatari. 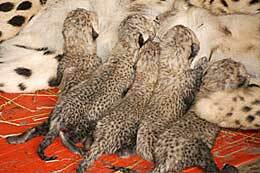 On April 1, 2016 Vaila, a first time mom gave birth to 7 cubs (this number only happens 1% of the time in cheetah births) sired by Hatari. Unfortunately, Vaila’s inexperience as a mom showed when she did not clean the birth sac surrounding one cub and it did not survive. Also, one was born with a deformity and only lived a few hours. The remaining 5 are doing well. On April 2, 2016 Wiay, a first time mom gave birth to 6 cubs( only happens 8% of the time) sired by Kitu. 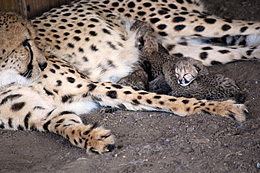 Because of her inexperience, she accidentally laid on one of the cubs shortly after birth and it did not survive. Initially Wiay’s cubs did not gain weight and thrive as well as they should. We weighed them every day, sometimes twice a day, and gave them medical attention as needed. The 5 are now all doing well with mom. NOTE: To watch this cam, you’ll need a Flash-enabled browser. After running for more than one year, we have turned our cheetah cam off. 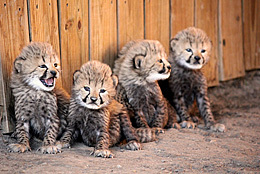 We need to move Vaila and her cubs to a different enclosure inside the Cheetah Breeding Center. Thank you to everyone for watching. We appreciate the support. Until next time! Learn more about how we are implementing cameras in other parts of the Zoo!